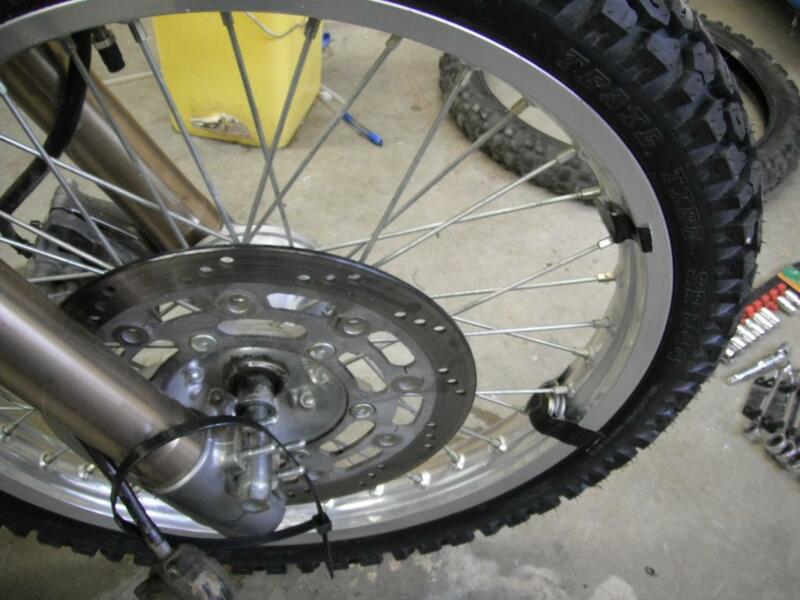 I watched the videos on youtube last night and I am going to try the zipties tonight on my son's TTR 90. 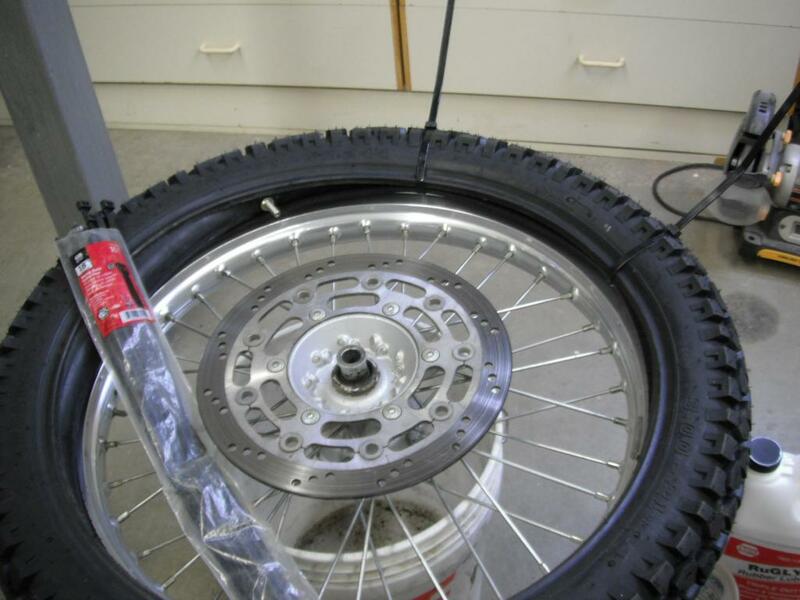 When you are remounting the tire, do you have the tube's valve sticking out a little from the zipped tire and then pop it through the rim before trying to push the bead in, or do you use one of the fishing tools? 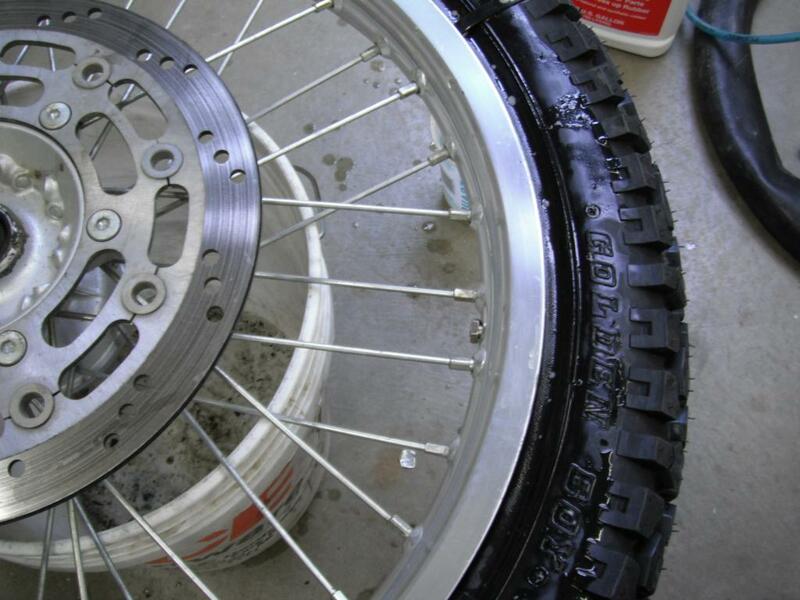 All the videos I saw were for tubeless tires. I have a valve fishing tool but it is not really needed. I don't always use it in fact. 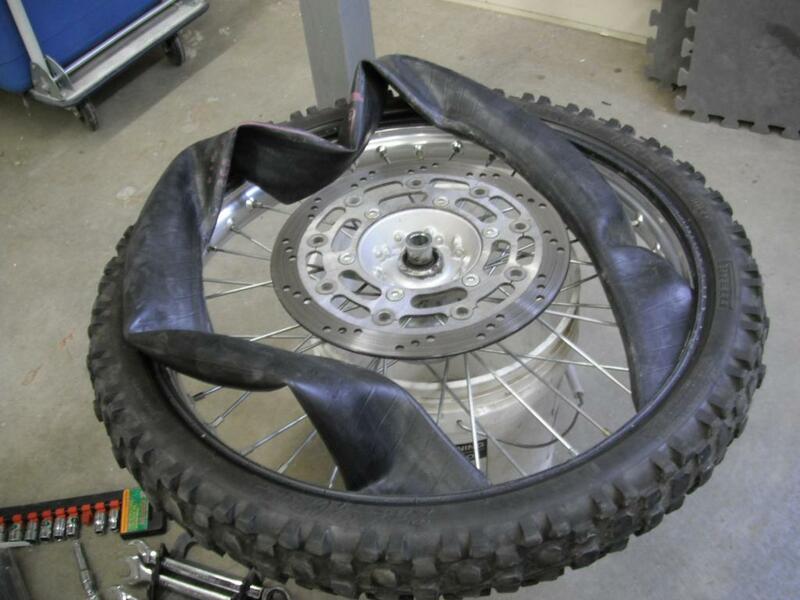 You put the tube in the tire and then put a little bit of air in it to hold it inside the tire. Then I use the zip-ties and cinch it up tight with the valve sticking out as much as possible. 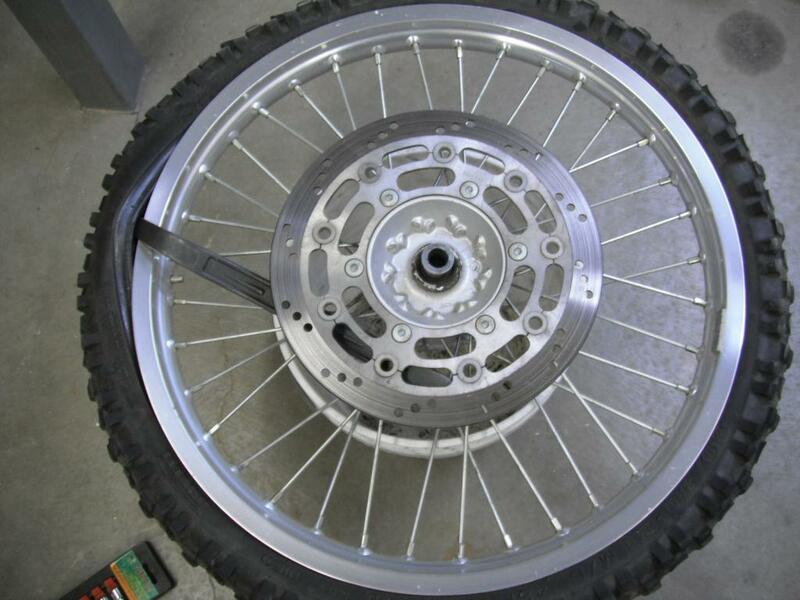 To install on the wheel I start at the valve and by putting the tire in the well of the rim at the valve, the valve stem sticks through easily with out fishing. 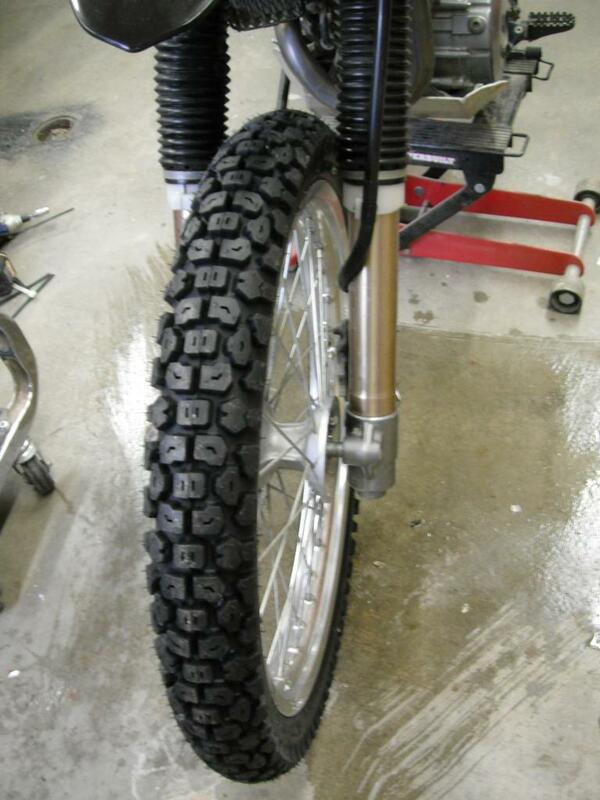 I then put on the valve stem nut so the stem wont pull back through. Everyone done yelling "don't do that!" ? I leave the nut at the end of the stem, not tightened up. 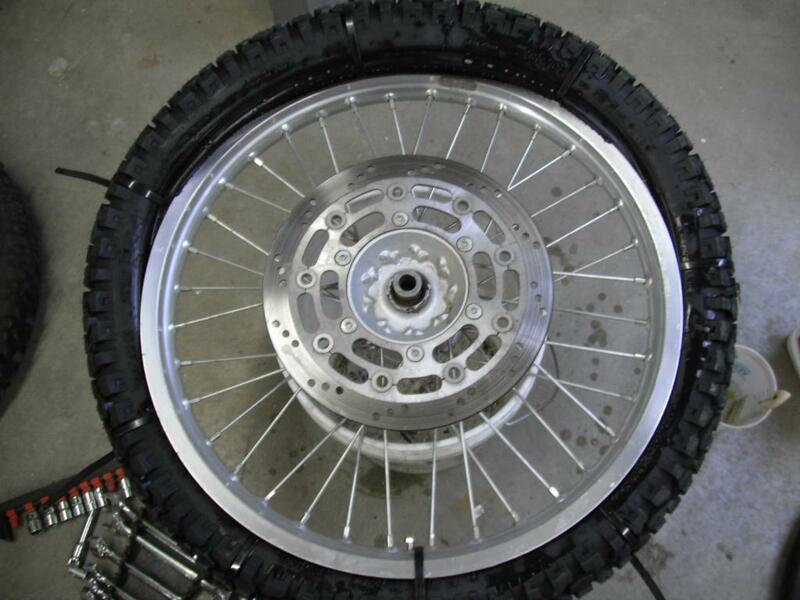 That way the tire/tube can move a bit and I can see if I need to make sure I am not moving the tire/tube around the rim. If the stem angles, I adjust where I am pushing. 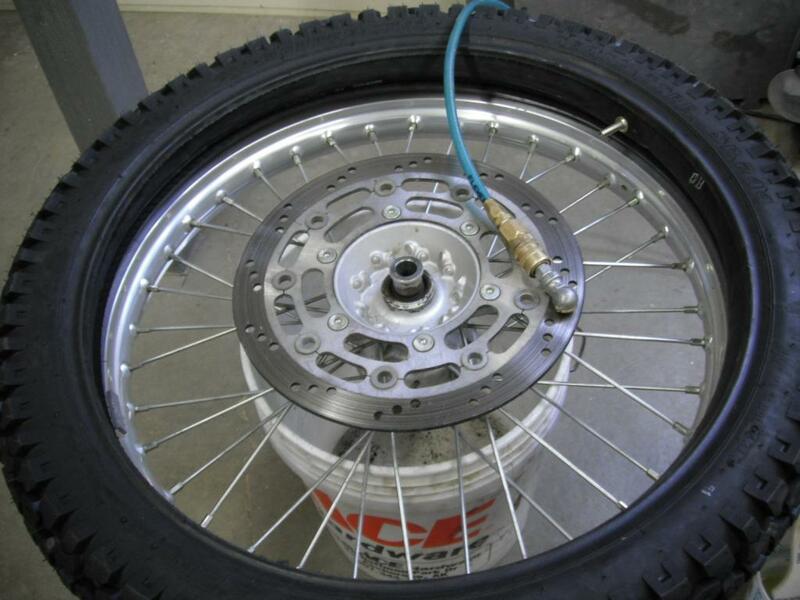 I also install a zip-tie or two around the tire AND rim at the valve once it is in place. 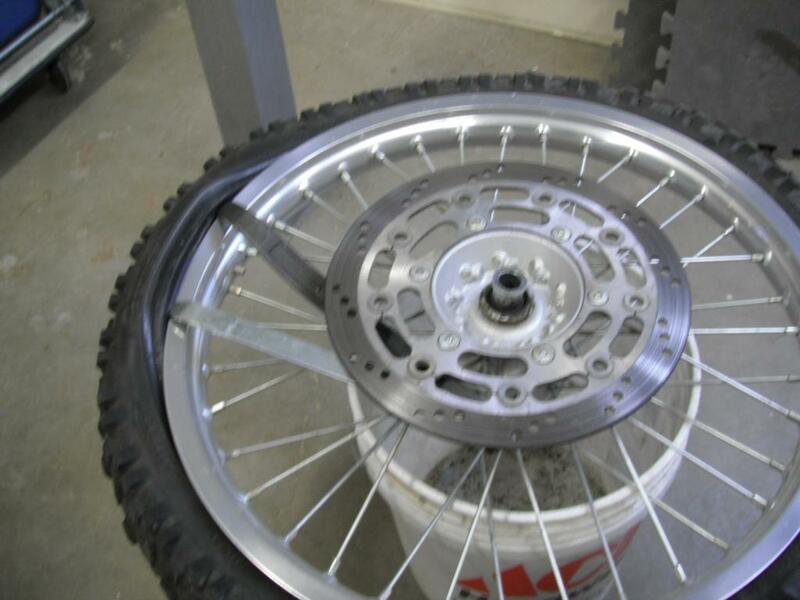 That keeps the tire down in the well and from rotating on the rim during installation. I checked my zip-ties and see that I am using 18", not 24" as I had posted. 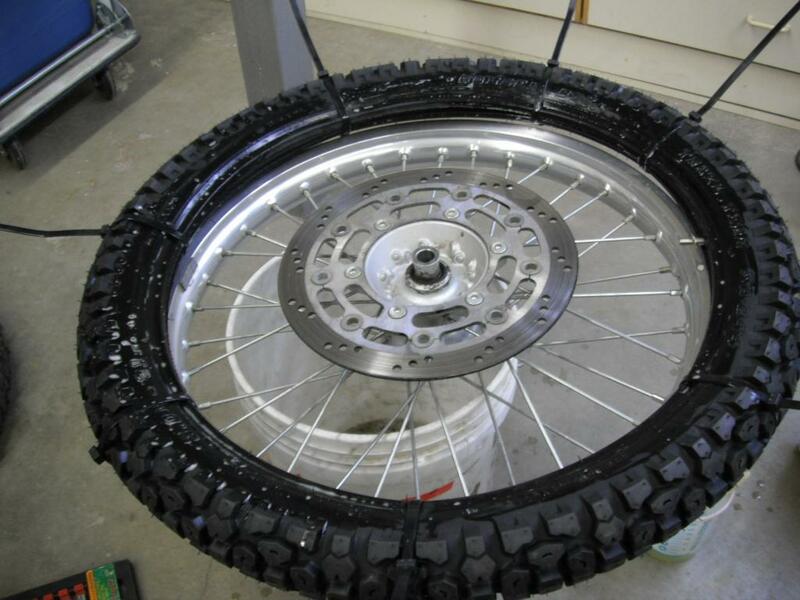 I use 6 or 8 or more as needed to keep the tire tight. 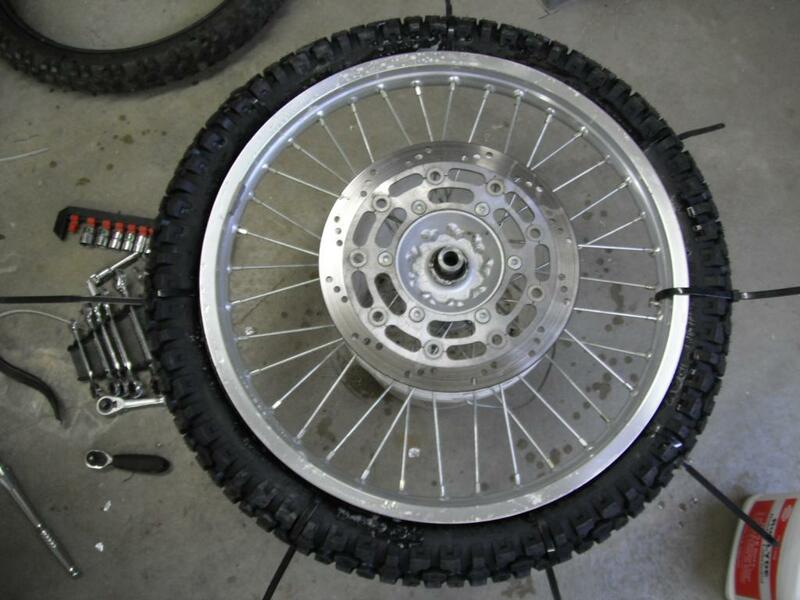 Far more than the one video I saw of the guy installing the tubeless tire. 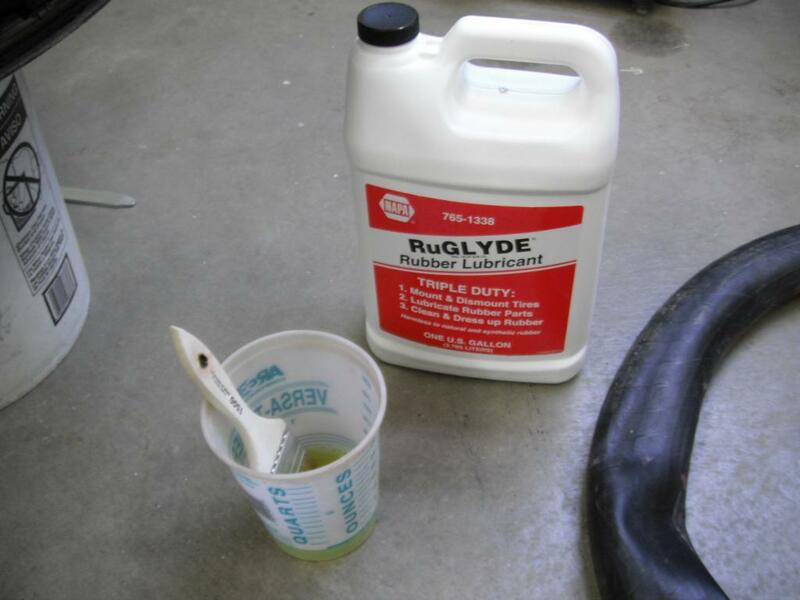 I stopped at NAPA on the way home last night and picked up a gallon of "Ru-Glide" rubber lubricant to test and see how I like it for mounting tires. I only wanted a little can or bottle but that was the only size they had so they gave me a discount. I will be switching out my worn out front tire tonight and will see how it works. Scored a X40fox titanium muffler for $65 also. This should keep me busy for a little. Over the course of 30k miles, my vapor has had the odometer suddenly lose its mind and jump 24k miles, and now I have to push the center button to clear the display when I first turn the key on. It doesnt remember where it was when you shut it off, so basically I turn the key on, then hit the vapor twice, then fire it up. My Vapor was not holding it's milage (both trip and overall). Was driving me nuts. :huh I called Vapor and as soon as I told the tech it was a DR650 he said the likely problem was the battery vibrating and not making good contact, recommended putting a bit of rubber between the battery and the cover. 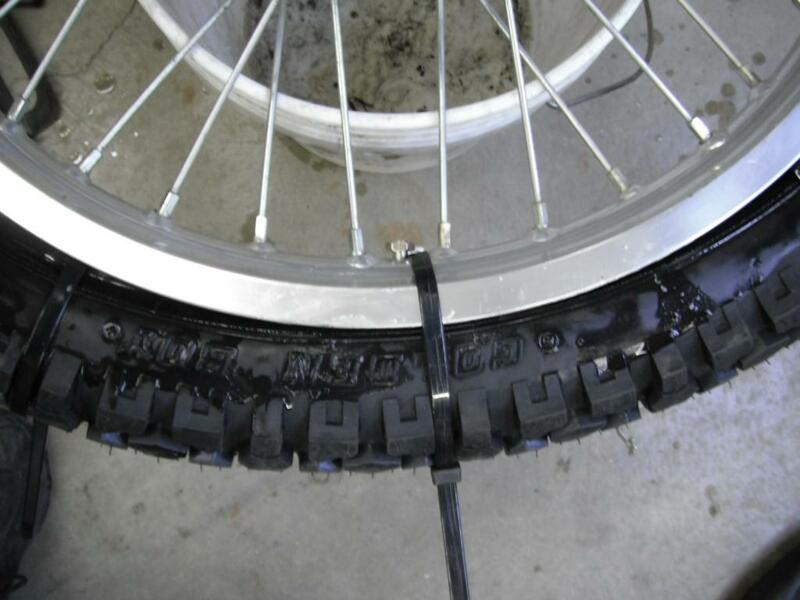 I used a bit of old inner tube, worked like a charm. i have a valve fishing tool but it is not really needed. I don't always use it in fact. Where are you guys finding these x40f0x mufflers, I have been looking for mouths and haven't even found a over priced one on fleebay. Craigslist, use searchtempest.com to find one not in your local area. Found it on craigslist, just have to keep looking. Rusty Rocket Life behind "Bars"
Stock tank and ironing board (oh wait, that's a seat!) from a 2011 DR650. Both are pristine; I replaced them within a 1000 miles of purchasing my bike (I bought it new). First preference will go to anyone in the Omaha area who's willing to pick it up at my house. After that I'll send the stuff to anyone who's willing to reimburse me for packing and postage. This for those who are struggling with tire changing or who hate paying a shop to do it. Step 1. Get comfortable, as much as possible anyway. Step 3. Remove the valve core to get all the air out of the tube. Step 5. 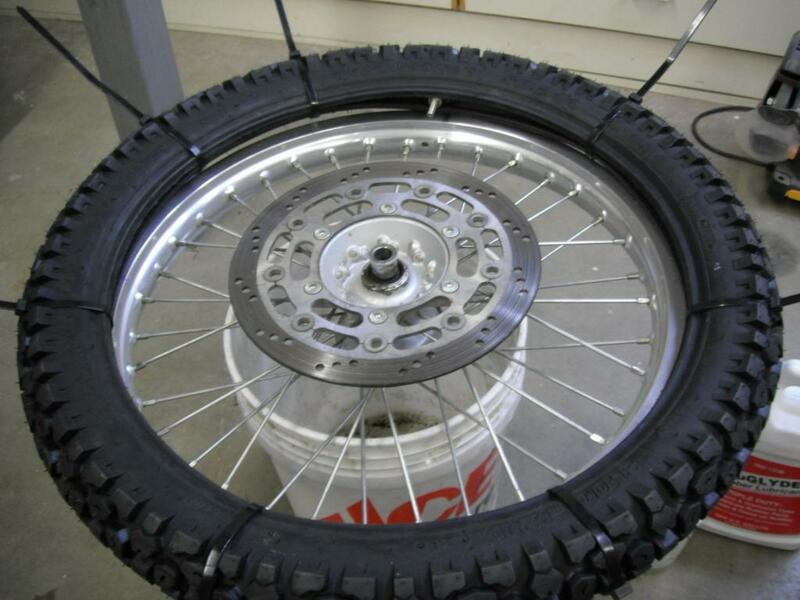 Break the bead of the tire off the rim on both sides so that the tire is loose. Mine only required finger squeezing working around to come loose. 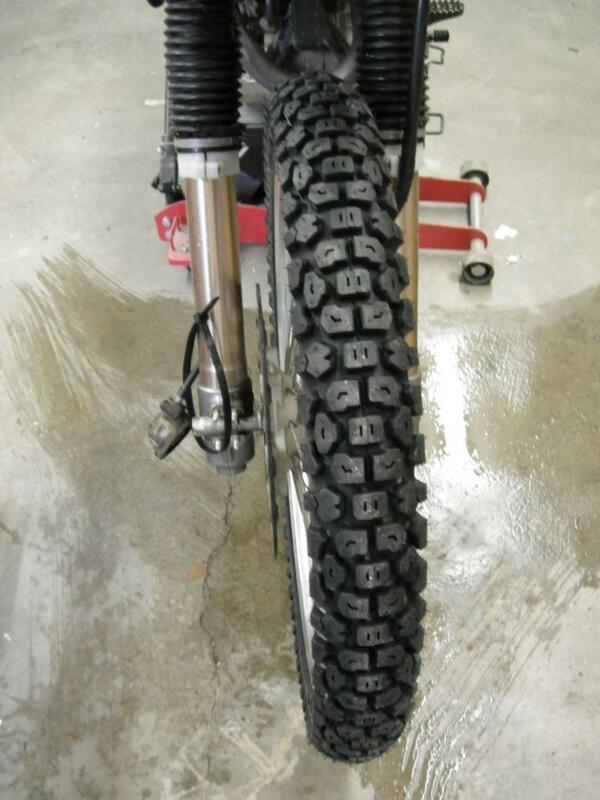 The rear tire I did last month seemed to be bonded on and it required C-clamps and wood blocks to tear it loose. Step 7. 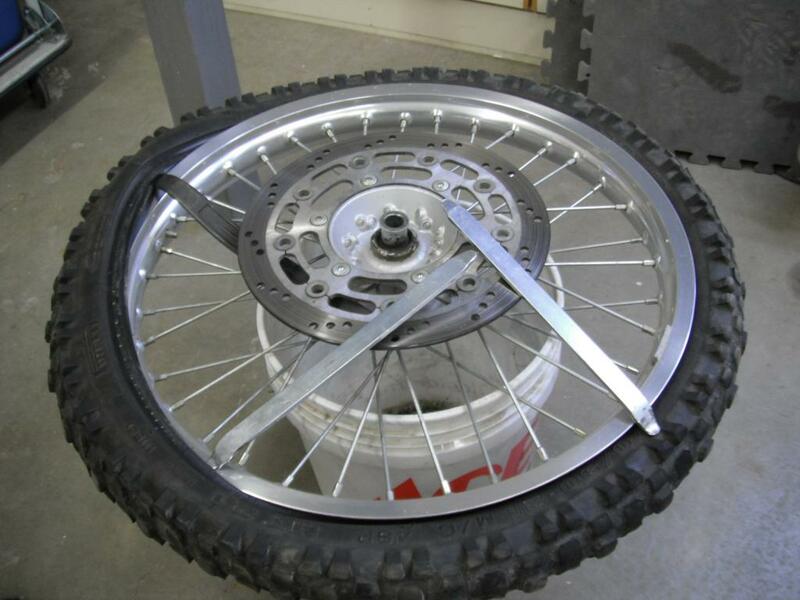 Use the tire iron to peel the other side of the tire off the rim. I used two levers and then it pulled right off. 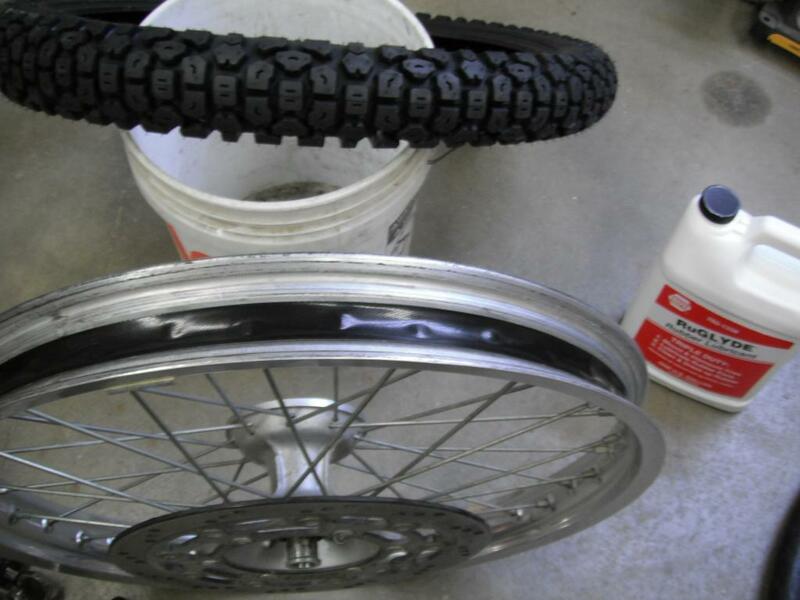 Step 8. is to make sure the rim strip is in excellent condition to protect the tube from the spoke ends. I think it worked very well and is less messy than dish washing soap and it dries much quicker and cleaner. I squeeze the two beads tight together to protect the tube. It took maybe 30 seconds to install the tire after putting the valve stem nut on. Much less time than it took to write the sentence about it. Then I slip a small screw driver tip into the lock of the zippies and undo them before pulling each one out from between the tire and the rim. 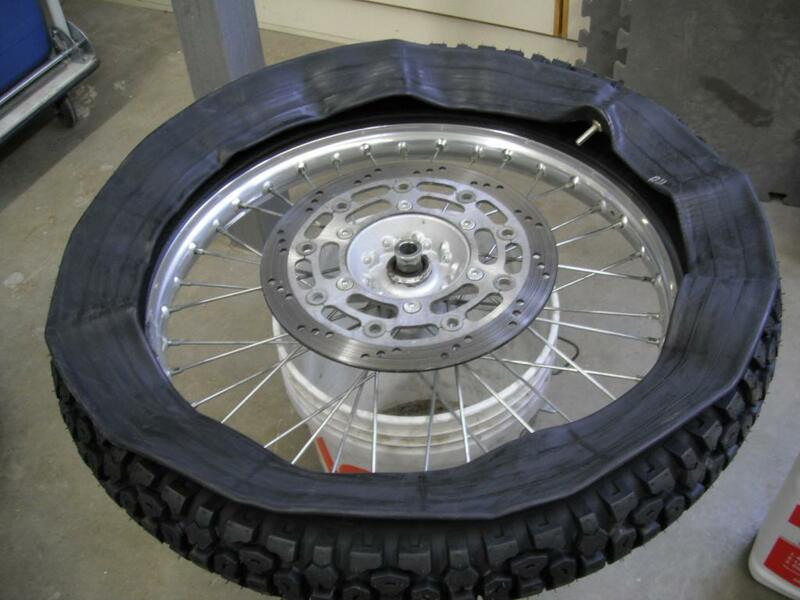 Then inflate the tire and make sure it is fully seated on both sides of the rim. 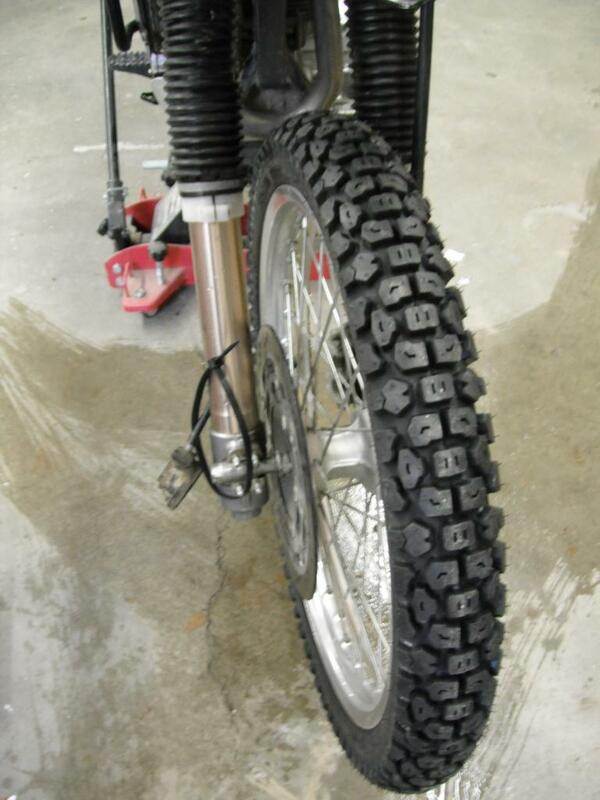 I think the RuGlyde may have helped the tire seat easier but the front tire always seems to be easier than the rear. 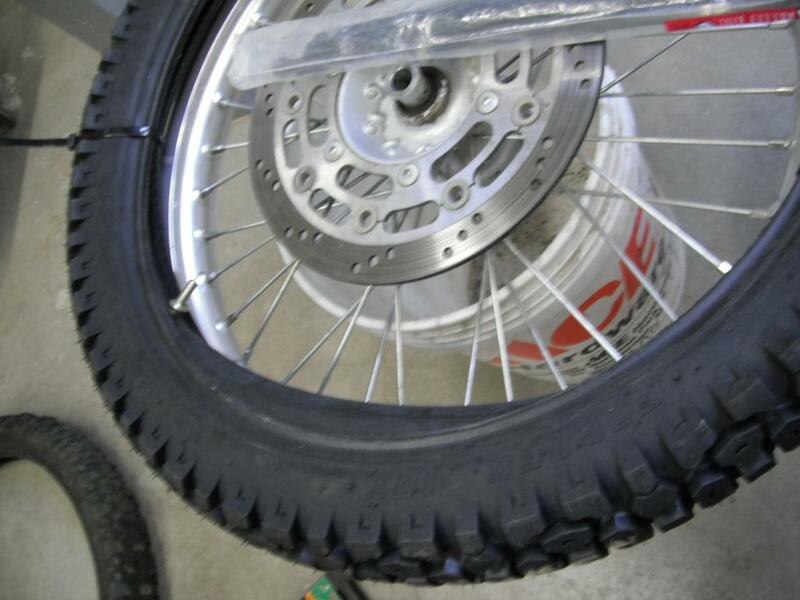 And the Shinko 244 is not a stiff carcass tire either. Total time to switch the old for the new was far less than the time it took me to post this. On to step... whatever, balancing. Now I will weigh the washers and get weights to install and then remount the wheel and be happy another job went smoothly and easily. I don't have rim locks so I am not positive that this technique will work as outlined. 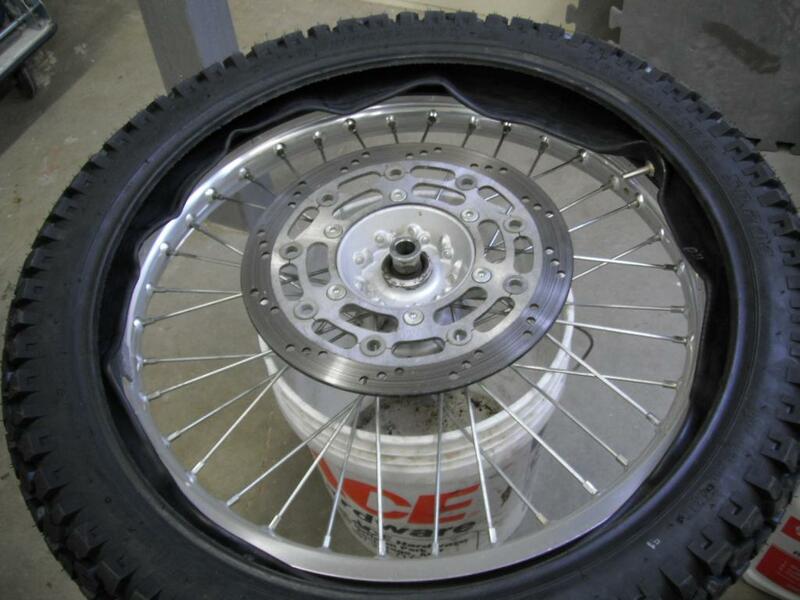 However, the rim lock will have to located in the zipped tire/tube exactly where it has to be in relation with the valve stem and rim holes. Damn fine series of photos. Thanks for taking the time. What db is the exhaust rated at? Very nice write up. Thank you! Thx Rusty - something else for me to geek out on. Nice site. Lets just say I'm picturing YOU with all those knives sticking out! Hopefully you'll have one ready for me before July, I would assume the price would be reasonable...although this is about motorcycles,what does reason have to do with it?